It turns out that 2017 isn’t only the year of self-driving cars and robots that rap; now, we have virtual anime girl YouTubers. A.I. Kizuna does everything a meatspace YouTuber would. She debates hot topics like buying friends with money and does Let’s Plays of games like Inside. She talks about furniture she wants and draws silly pictures of cats. She’s even been banned—it was after she joked that, because she’s a hologram, she’s technically naked. Shortly after, her channel was reinstated. Kizuna’s pretty active, uploading YouTube videos every few days since she launched her channel three months ago. She’s already garnered about 200,000 subscribers. Her creator, predictably, is elusive. 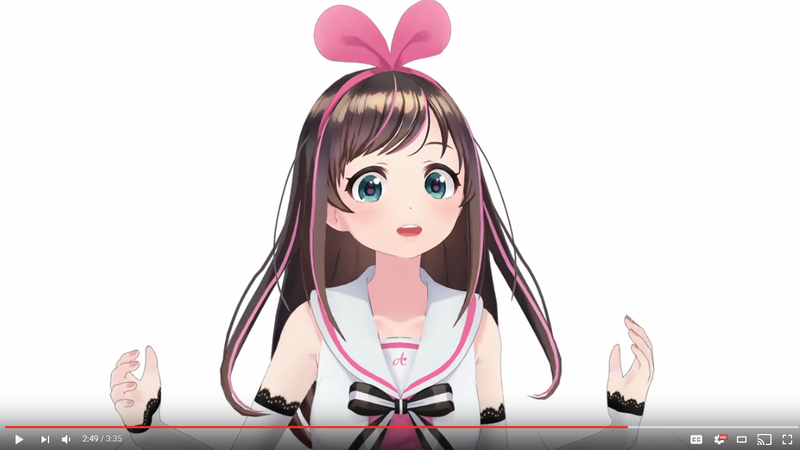 It looks like Kizuna was made in Miku Miku Dance, animation software that lets users import and control 3D models of anime characters. It’s what breathes life into Japan’s vocaloid pop sensation, Hatsune Miku. Perhaps, by the end of the year, we’ll all be interfacing through virtual anime girl software. Welcome to the future. Hope it’s everything you asked for.